If you still have questions, submit via email. Please, no calls. Open to all media. There are no size limitations for entries. Please include specific dimensions with your entry. Bedford Gallery reserves the right not to accept exceptionally large, heavy, or cumbersome pieces. Work must be framed (when applicable) and ready to hang (wire, d-rings, or cleat). Acrylic glazing only; NO GLASS. All art must be labeled with artist's name, title, medium and year. A non-refundable fee of $35 is required for application. This fee covers up to 3 entries. One application per artist only. Online submissions are not considered complete until payment is made. All accepted entries must be received by Bedford Gallery by June 19, 2015. Please label all packing materials with your name. Shipped work should arrive in a reusable container with return postage or prepaid shipping documents and correct return labeling. Be sure to indicate insurance value for shipping both ways. Hand-delivered artwork may be dropped off June 15 through19, between 10:00 a.m. and 5:30 p.m. only. Following the close of the exhibition, artwork can be picked up September 6 between 5:00 and 7:00 p.m. and September 8 and 9, between 10:00 a.m. and 5:30 pm. Please arrange for a representative to pick up your work if you are unable. Artwork remaining at the Bedford Gallery past specified pick-up dates and times will be subject to a $10 per day storage fee. Shipped artwork will be packaged and shipped beginning on May 27. Return of work without return postage or prepaid shipping documents will be delayed. Artists are encouraged to sell their work. Artists receive 60% of the sale price for work that is sold. In the past, public interest in available work has been high and the Gallery believes such artist-collector dialogue is a vibrant part of exhibitions. All work must have a declared value for insurance purposes, even if it is not for sale. Artwork accepted for the exhibition will be insured by the City of Walnut Creek from the time it is received and inspected by Gallery Staff until artwork is tendered to shipper for return to the artist or artist’s agent. Delivery and pickup are the responsibility of the artist. During the exhibition, artwork will be insured against all physical loss or damage from any external cause. Insurance is limited to the wholesale value at the time of loss. If damage occurs and the piece can be repaired, liability will be limited to the cost of such repair. Submission of work constitutes an agreement to the conditions set forth and acceptance that the decisions of the juror are final. Bedford Gallery may photograph and reproduce accepted work for promotional purposes. Artists may not withdraw accepted entries before the close of the exhibition. Bedford Gallery is not responsible for refunding entry fees or allowing artists to change submission information for artworks which do not meet above rules. Bedford Gallery will only be accepting online entries for Botanica through the online, portfolio review site SlideRoom. 2) Follow the instructions to upload up to 3 entry images (up to 5MB; jpg, png, or gif). Video artists may submit files in mov, wmv, flv, or mp4 format (up to 60 MB). Complete entry details. You can save your progress and return to your entry at any time before the deadline to edit your information. 3) Complete payment information to finalize your entry. You cannot edit your entry after submitting payment information. Payments must be received by the deadline for your entry to be accepted. Please do not submit any materials directly to the gallery. We are not requesting statements, CVs, or other materials at this time. If you need help using SlideRoom, please consult their Help Desk. We recommend starting with their handy Step-By-Step Guide. Bedford Gallery is unable to provide technical assistance for applications. The gallery will not accept late entries. Please give yourself enough time to complete the application process. Artists notified of juror's results by email. Drop-off for selected artwork from 10:00 a.m.-5:30 p.m. Deadline for receipt of shipped selected work. Exhibition Opening Reception, 3:00-5:00 p.m. Pick-up of artwork Sunday, Sept 6 from 5:00-7:00 p.m., Tuesday-Wednesday, Sept 8 and 9 from 10:00 a.m.-5:30 p.m. Shipped works are sent back to artists. Gallery will be closed Sept 7 for Labor Day. 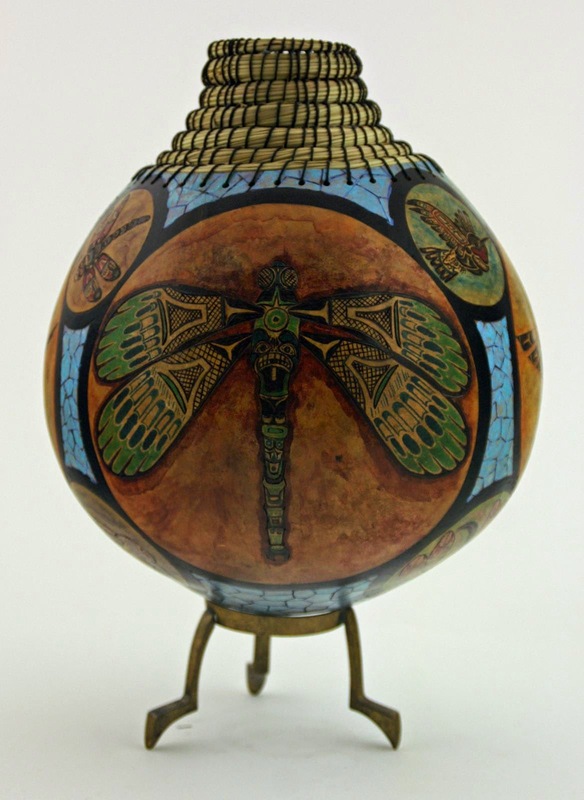 Gourd artist Heather Hopman will be demonstrating at the February 11 meeting of the Amador County Artists Association. 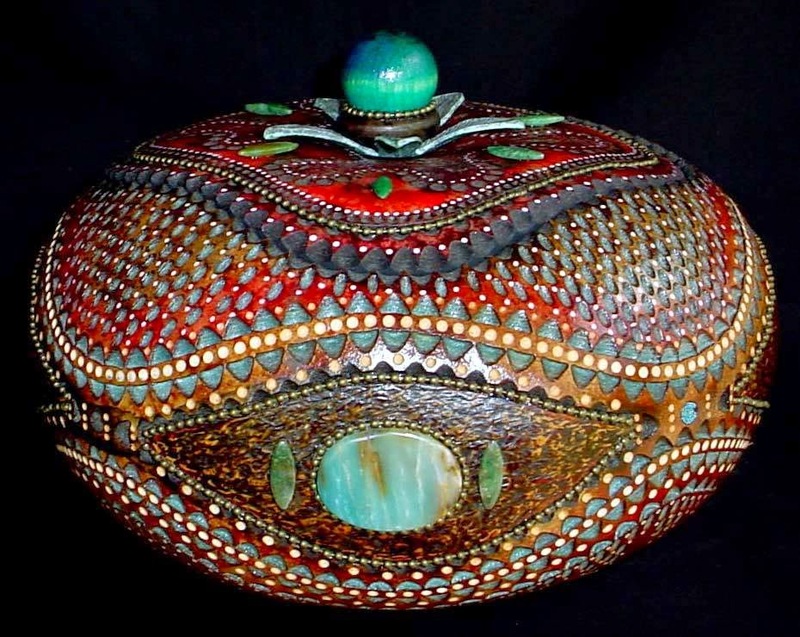 She has been an artist her entire life and has been creating gourd art since 2005. Her gourds are enhanced by a variety of techniques including painting, dyeing, burning, carving, and surface embellishments. She has won awards at both the local and state levels. 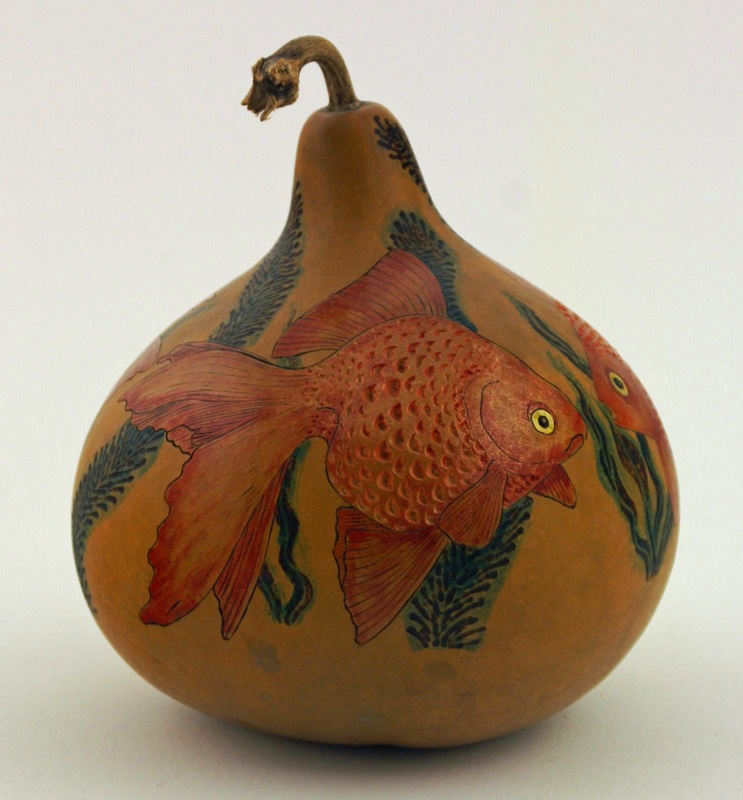 Heather has been a member of the Amador County Gourd Artists chapter of the California Gourd Society since 2006. Her other media include glass beads, ceramics, metalworking, blown glass and water colors. She and husband David own Chaos Glass in Sutter Creek. 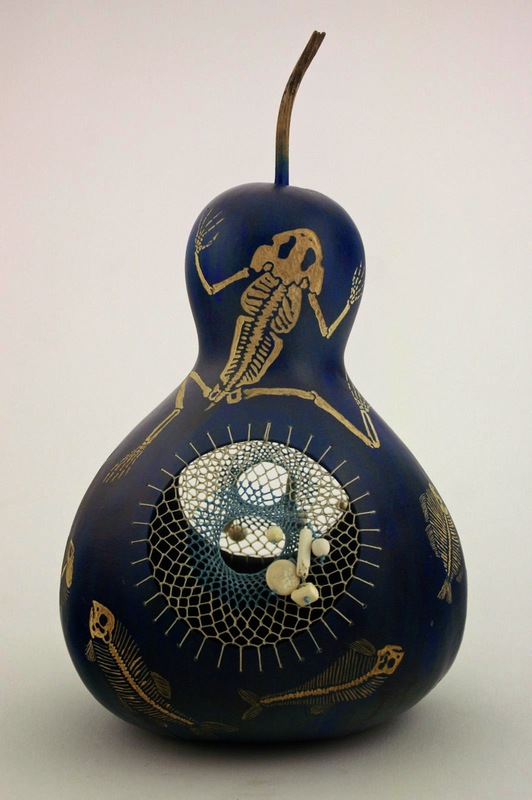 AMADOR GOURD ARTISTS are delighted to host national award-winning gourd artist JOYCE CAMPBELL at their meeting on Thursday, February 12 at the Agriculture Building, 12200-B Airport Rd., Jackson. The general meeting will start at 9AM and Joyce will share some of her knowledge from 10 to 12 noon. 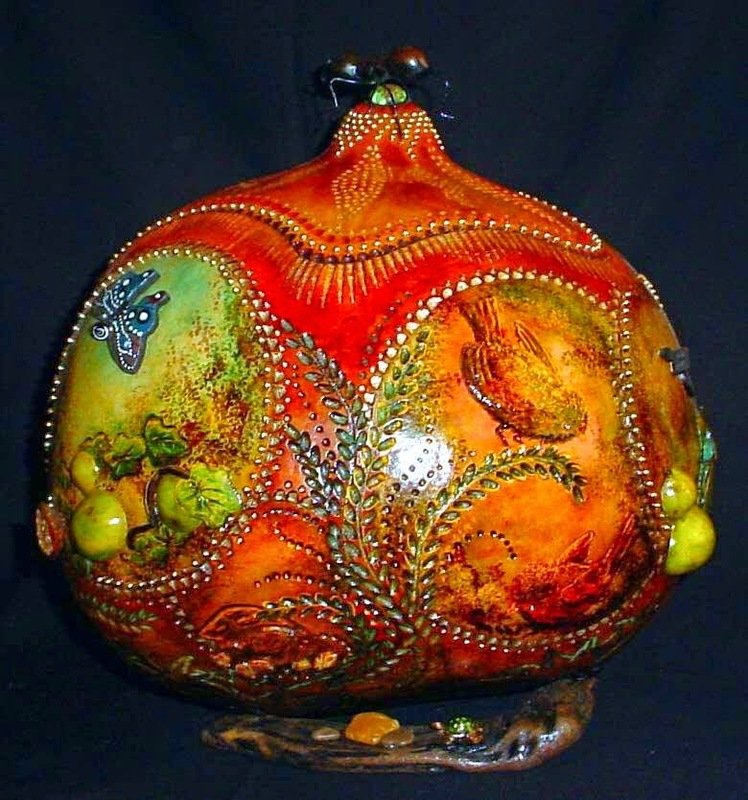 Joyce began creating gourd art 29 years ago on the East Coast where she won numerous Best of Shows at gourd and art shows. She came to California several years ago to be with family and has continued her winning ways, winning numerous ribbons in the Masters Categories along with Best of Shows. Joyce will speak to her audience regarding planning an art piece and solving problems as one works toward the finished product. 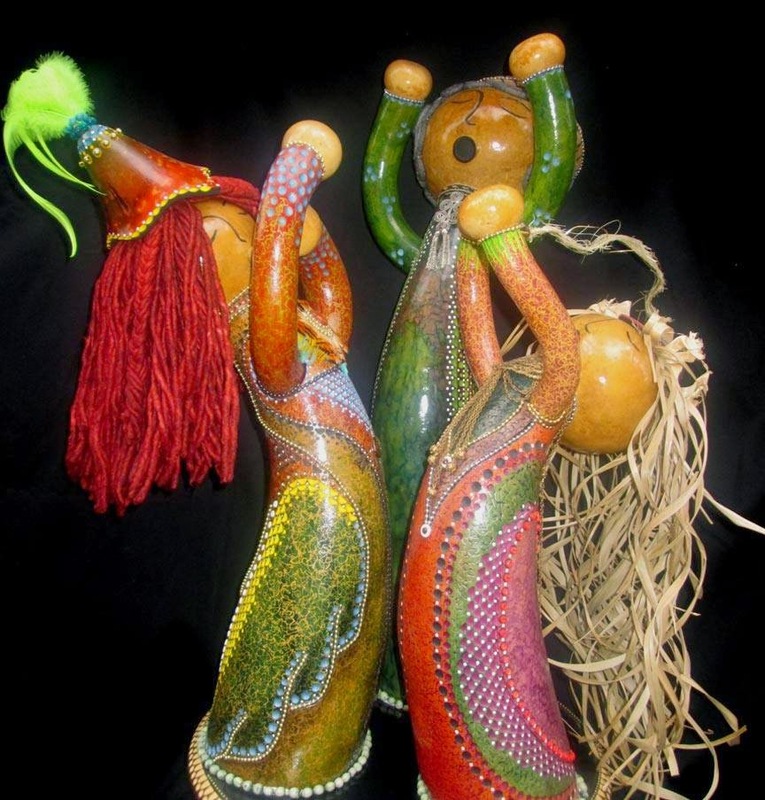 Her specialties are carving, using and inventing embellishments, and adding multi-layered colors. Joyce likes to give her students some tools while encouraging them to be creative and move forward with a freedom that often opens new horizons. Participants are invited to bring a piece of work they may have had trouble with and Joyce and other gourd artists will critique and offer suggestions of how to move forward. 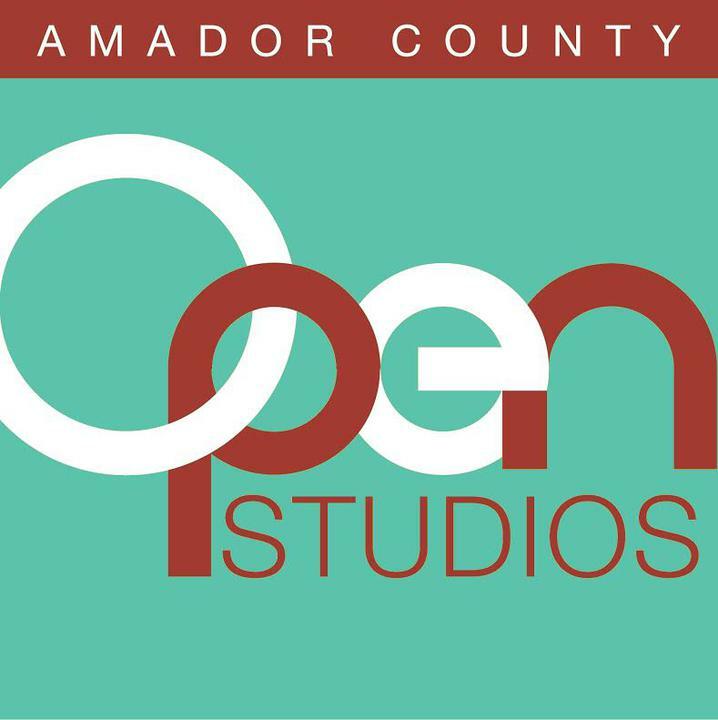 Amador Gourd Artists asks non-members for a $10 voluntary donation to cover some of the artist’s expenses. For more information, call Aaron Bullock at (209) 274-6565. I took this photo of “Sam & Samantha” in Yosemite. It was about 20 degrees that day with a wind chill probably below 0. I was at one of my favorite places in the park when the two ravens landed on a snowbank right in front of my car. They were grooming each other and I was transfixed. I begin taking photos from the car where it was nice and warm but soon realized I wanted to get closer to them. I moved slowly and to my amazement they didn’t fly away. I shot them for over an hour. I had to keep jumping in and out of my car it was so cold. Each time I would return and kneel in front of them they would look right into my lens; I eventually just sat in the snow to take the photos. I swear they knew all about composition and posed perfectly for me. Many visitors to the park walked around me and never even stopped to look at them. I won first place in the Photography Division of Northern California’s largest juried art show with this image. In addition, I entered the photo into a juried photography contest in Black & White Magazine. The fine art photography magazine www.bandwmag.com/ has more than 40,000 viewers worldwide and is sold in 60 countries. “Sam & Samantha” were juried in and are featured in the February Special Issue, 2015 Contest Winners edition of Black & White Magazine. 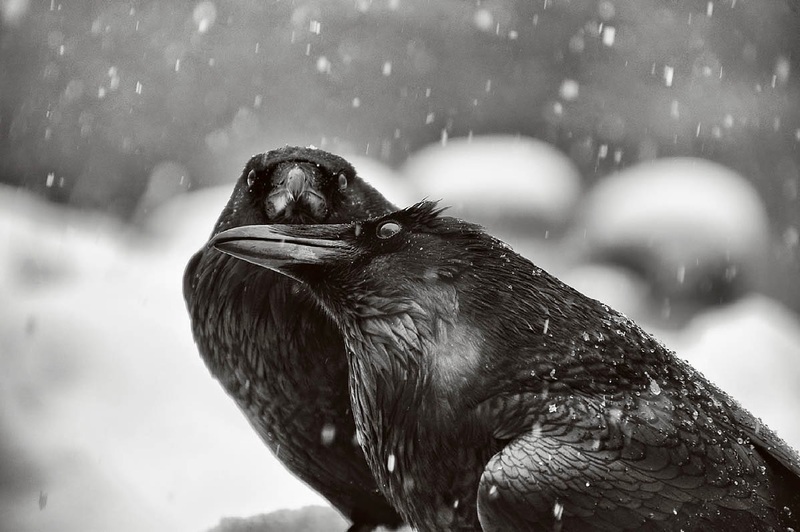 I am proud that others are now able to see these beautiful ravens up close and personal. In March of 2014, Anje Olmstead was commissioned by the Jackson Rancheria to do a portrait of their deceased leader, Margaret Dalton. The initial request that the portrait be done in casino chips evolved (after four different samples) to a totally collaged portrait that measures 9 feet wide by 8 feet high. Input from the tribe to be included in the portrait were visuals such as pictures of tribal members, photos of life events, i.e. meeting with [then] President Clinton, as well as [then] Governor Pete Wilson, and photos of her with some of her favorites, such as her grand-daughter, a couple of well-known country singers, a large stuffed rabbit, plus much more. The collage visually tells her life store. On February 9, the Tribe will hold a sacred unveiling ceremony which will be attended by Tribal members and a limited number of guests. After February 9, the portrait will be open for viewing by the public. It will be installed just outside of Margaret’s Cafe at the Jackson Rancheria. Jim Glanton, Sutter Creek Gallery’s featured artist for the month of February, has always been interested in drawing and painting and was encouraged by both parents and teachers. He attended art classes in college prior to joining the Air Force. After his Air Force stint, Glanton landed a job in a Southern California architectural studio as an illustrator. “A fellow artist and I would illustrate during the week,” he remembered, “and paint plein air on the weekend.” After moving to Northern California in 1976, he worked for another architectural firm, the Dahlin Group, in Pleasanton, retiring in 2009. During all those years as a commercial artist, he learned to love painting with watercolor and acrylics, which is still a passion today. His subjects range from realistic landscapes to abstract flora and fauna to cartoon-like images. His abstract paintings utilize acrylic paints while the others are generally rendered in watercolors. In the 1960s, Vincent price chose two of his paintings for a national traveling show. Since then, he has shown his art throughout Northern California. One such exhibition was a 2014 invitational sponsored by his former employer, the Dahlin Group. For the last two years, his work at the Amador County Fair has drawn many awards. Sutter Creek Gallery invites you to meet Jim Glanton at the reception in his honor on Saturday, February 7, from 4 to 7 p.m., as part of the region’s First Saturday Art Trek. He is one of the local artists exhibiting at the cooperative located in the heart of Sutter Creek at 35 Main Street. Besides original paintings and photographs, Sutter Creek Gallery offers many affordable items including prints, cards, jewelry, gourds and fiber arts. The gallery is open Sunday, Monday, Wednesday and Thursday from 10 a.m. to 5 p.m., Friday and Saturday 10 a.m. to 6 p.m. For additional information, call 209-267-0228 or email suttercreekgallery@gmail.com.